It’s always good to see events that promote a positive image in the LGBT community. 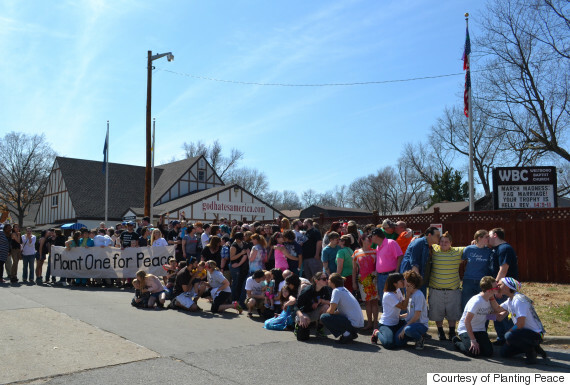 Last Saturday one such event was held as the Equality House celebrated its 2nd Birthday in Topeka, Kansas. For those of you that may not know the house is located across the street from the infamous and much publicized Westboro Baptist Church (WBC) that was once headed by the now deceased Fred Phelps. The people who were in attendance seemed to be filled with a positive sense of fellowship and joy as they mingled and participated in the fundraising events of the day. Everything culminated in a giant group kiss or “Planting one for Peace” as it were. We are happy to report all kinds of people — queer couples, straight couples and families showed up to participate and ex-members of the WBC even dropped by including Libby Phelps who, organizers told The Huffington Post, was in the crowd with her husband kissing her baby. 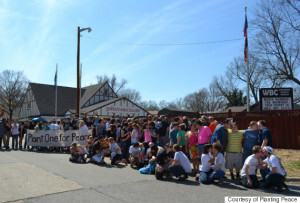 This entry was posted in Activism, Education, Entertainment, History, Politics, Religion and tagged equality house, topeka on March 27, 2015 by .